Lee Seung Gi of MBC drama The King 2 Hearts (TK2H) is displaying the posture of ‘legendary prince’ with 10 sets of charming pose. Lee Seung Gi is playing the role of South Korean prince Lee Jae Ha who is a slippery fellow, not serious and exaggerated own abilities. 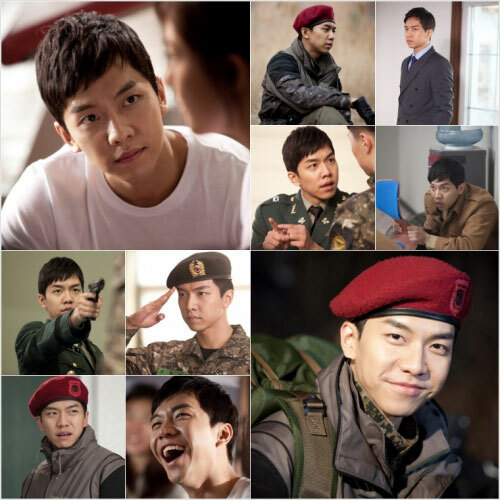 Lee Seung Gi perfectly portrays a typical rogue prince whom will only satisfied when done according to his wishes. The excellent performance is critically acclaimed. In particular, Lee Seung Gi displays charisma which is full of power through the ’10 magical poses set.’ The outstanding body which is shown regardless of dressing, the sincere during distress, humor that is everywhere, and other irresistible charms. Lee Seung Gi has consistently maintained powerful sly and pretending when hiding behind the chair when was ambushed during WOC training or let other glides the bullet through his finger and other ridiculous acts done by abrupt prince. The calm when pointing gun at other and looking with sharp eyes, and the boldness of sticking to the last when his pride been aroused under desperate circumstances, the Lee Jae Ha who perfectly transformed into constantly changing prince firmly captured the audience’s attention. Coupled with his sense of guilty after causing the North-South unified team to dissolve, the sweet and deep eyes when looking at Ha Ji Won as if feeling subtle feelings for her, the adorable envious heart in the heated conversation between Ha Ji Won and Jo Jung Suk, Lee Seung Gi also capture the hearts of woman with simple and cheerful look. The number 1 ‘magic’ of Lee Seung Gi must be the magical version of murderous smile and vibrant uninhibited laughter. The same bright smile and laugh out loud that never changes, or cheerful laughter that expresses happiness, the naivete charming guy is melting the hearts of many viewers.